Imagine an adaptation of a Harry Potter book that showed you his world only as the Muggles see it. The story would lose both its magic and its point. That is exactly what happens in Anne Nenarokoff's inept adaptation of Russian writer Mikhaïl Bulgakov's novella Heart of a Dog. In the story a stray dog, Sharik, is captured by Professor Philipovitch, who grafts onto it the pituitary gland and testicles of a recently deceased criminal. Sharik gradually evolves into a human being with a strong animal nature who joins the Communist party. Bulgakov's satire thus sees Communist society as much a Frankenstein's monster as Sharik. No wonder the work written in 1925 was not published in the Soviet Union until 1987. Bulgakov's novella is narrated from Sharik's point of view giving him long swaths of interior monologue even before he learns human speech. This gives the book its humour and peculiar poetry. Nenarokoff excises all of this to focus on the humans, including Sharik only when he is involved with them. All that's left is a tiresome series of would-be absurdist episodes about housing problems. At least 1920s silent film look of designer Rudy Braun, Glenn Davidson's moody lighting and Keith Thomas's witty retro-sci-fi score, give something to please the eye and ear during Nenarokoff's incredibly lame dialogue. All five characters are underwritten, but William Webster as Philipovitch succeeds best in finding nuances in his. 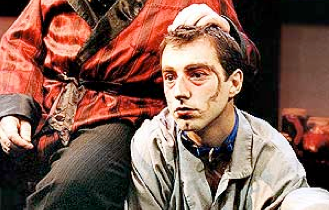 Rafal Sokolowski gives a fine physical performance as the sullen but naive dog-man Sharik. Director Jean-Stéphane Roy's stop-and-start pacing and added pratfalls and door slamming only make the dullness deadlier. Robert Astle's 1990 adaptation of the same story more logically featured Sharik as the sole character. Unsurprisingly, when Nenarokoff cut Sharik from the centre of the action, she cut out the story's heart. Photo: Rafal Sokolowski as Sharik the Dog. ©2003 David Hawe.